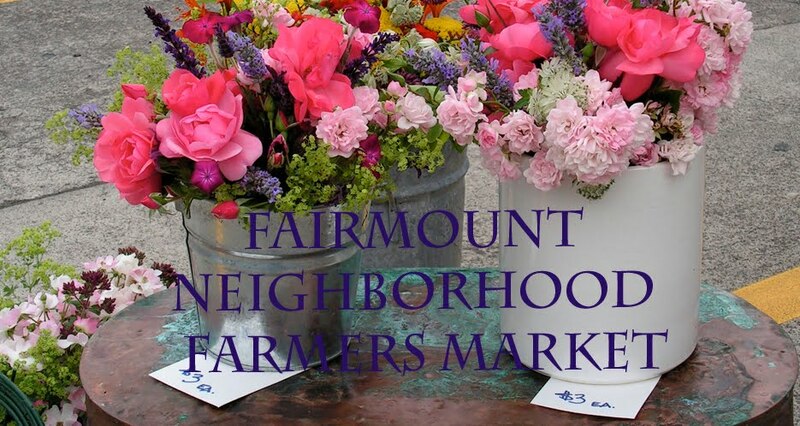 This Sunday at the Fairmount Neighborhood Farmers Market you will find fresh eggs and pastured chicken, beef, pork, and lamb from Fair Valley Farm and Fog Hollow Farm, baked goods made with local whole grains from WildFlour Oven, and fresh cut flower bouquets from Tiger Lily Art Company. Camas Swale Farm will have plenty of fresh fall produce including lots of sweet peppers and winter squash. 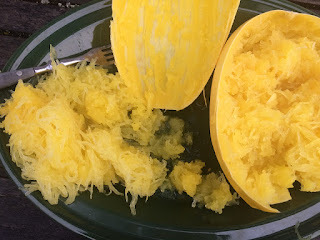 Spaghetti squash is a always fun member of the winter pantheon. 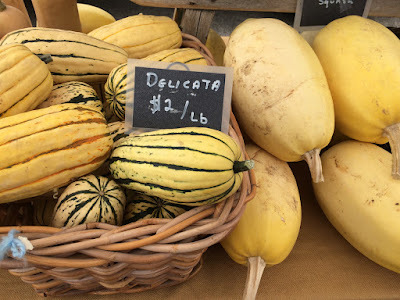 It can be cooked in the oven or steamed in a pressure cooker, and then brushed with a fork to release its spaghetti like strands. 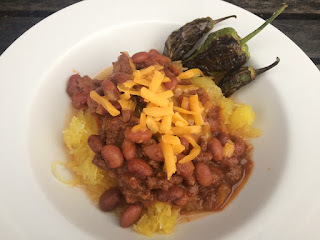 With the arrival of the chilly fall weather, I had a hankering for chili, which turned out to be delicious dolloped onto a bed of squash strands with a dusting of cheddar cheese and a side of seared padron peppers. 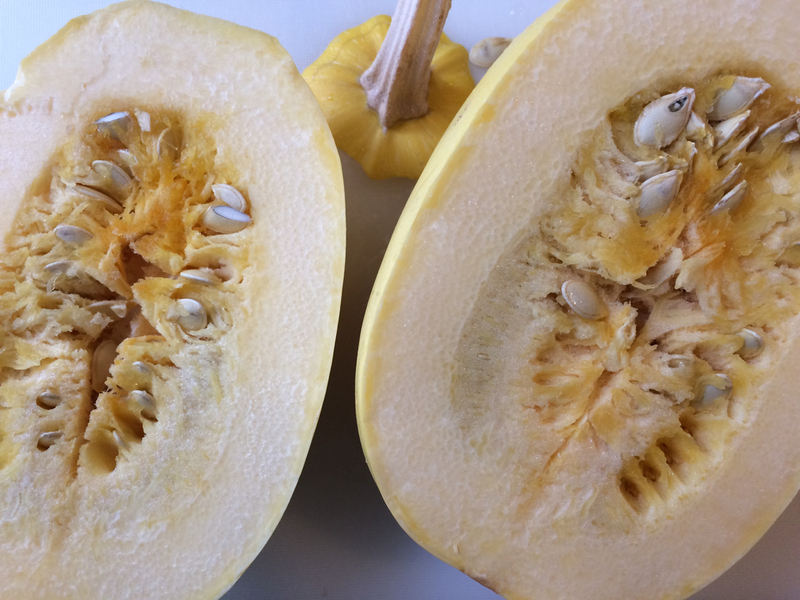 Cut off the stem, halve the squash and scoop out the seeds. Bake cut side up until soft for about an hour minutes in a 325 degree oven along with the chili, or steam in an Instant Pot pressure cooker for 6 minutes, followed by a quick release of pressure. Use a fork to release the squash spaghetti strands. In a Dutch oven or the container of an Instant Pot set to saute on high, heat the bacon drippings or oil and then saute the onions until translucent. Add the diced peppers and keep cooking until they are soft and the onions have started to caramelize. Add the garlic and saute another minute. Add the beef and saute until cooked through. Add the spices and cook for a couple of minutes. Add the tomatoes and the soaked beans plus two cups of water, beer, or reserved bean broth from a pervious batch of cooked beans. Mix and cook in a 325 degree oven for about four hours, stirring occasionally, until the beans are soft, or cook in an Instant Pot on high pressure for 25 minutes, allowing the pressure to release naturally. Taste and add salt as needed. If the chili is too liquid, you can thicken it in the stovetop or by using the saute function of the Instant Pot. To serve, make a bed of warm spaghetti squash and top with chili and a sprinkling of shredded cheddar cheese.